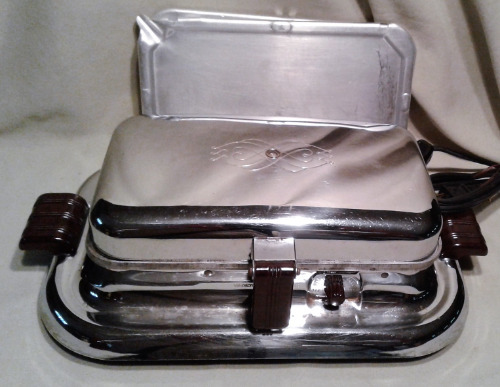 General Electric made quite a few of these handsome waffle irons in the 1940's after the war. Very handsome design with thermostat control, heating indicator, rectangular pattern waffles and griddles. Irons and griddles are removed easily for cleaning and /or switching from waffles to grilled cheese. Fairly simple design but rugged. Model 139G38. Perfect size for toaster waffles. Brown "Texolite" handles. Sort of an swirl design on the lid with the heat indicator in the center. This was their best model at the time, they used the same basic model with no thermostat cheaper. Nice new wiring and heavy duty heaters. It will last a lifetime. New 6 foot cord set. rewired, cleaned and ready. 800 watts, 120 VAC. General Electric, Bridgeport Conn, Ontario, Calif.